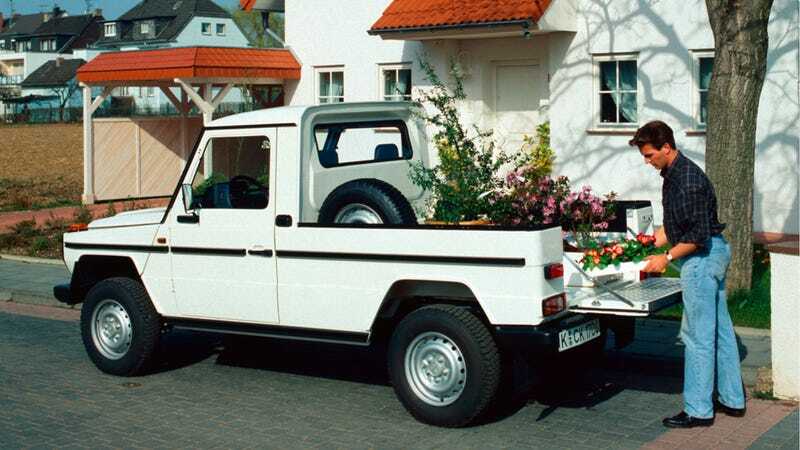 Since news broke this morning that Mercedes-Benz will build a mid-sized pickup truck, every comment I've seen has been "WTF," "stupid status symbol," or "why wouldn't they sell this in America?!" If those was your instinctive reactions, here's why you're wrong. Outside the US, the Mercedes brand transcends "blingmobile" and they're able to sell decadent S600s right next to an E200 with 184 horsepower, basic options, and a six-speed manual transmission. Mercedes doesn't bother hawking their bottom-trim offerings in America because they know we're too stupid to accept a brand associating with ultra high-end offerings and sensible base cars. Why else would Acura, Lexus, and Infiniti need to exist? Basically, everywhere else in the world, Mercedes makes cheap taxis. Here, they're the ultimate in luxury. Besides that, just about every car here is already trying to be a luxury car... you've gotta look hard to find a US model without navigation or at least leather on the options list. The upcoming Mercedes pickup (GLT?) will become a part of the company's work-rig division to help them compete even closer with Volkswagen Commercial Vehicles, which makes vans in various sizes, just like Mercedes. They also have a pickup truck (the Amarok) which can be spec'd from a chassis-cab stripper to a comfortable top-of-the-range model that is similar to our Chevy Colorado Z71. That's where Merc's truck is going to land on the luxury scale; not as AMG's idea of a Ford King Ranch, though that would be all sorts of rad. Mercedes' press briefing mentioned "payload of about one metric ton" as the standard for a successful pickup. One metric ton?! That's almost 700 pounds more than a Colorado can handle and probably enough to snap a Frontier or Tacoma straight in half. Though it is about the top end of carrying capacity for a VW Amarok. Daimler expressly stated their pickup truck will be coming from Mercedes-Benz Vans. That's the side of the outfit that's churned out the Sprinter, Metris, Vito, and nothing with massaging seats or "AMG" in its name. Dr. Dieter Zetsche, Chairman of the Board of Management Daimler AG, Head of Mercedes-Benz Cars Division, and CMO (Chief Mustache Officer) said "We will enter this segment with our distinctive brand identity and all of the vehicle attributes that are typical of the brand with regard to safety, comfort, powertrains, and value." Notice what was not mentioned? Luxury. And I'm pretty sure by "powertrains" he was talking about their reputation for quality, not performance. Sure does seem like America's got a disproportionately high percentage of the world's full-sized trucks, and they do top our sales charts every year, but there's more to pickups than the F-150, Silverado, and Ram. We're also hardly the only "truck country." Head to Mexico, Australia, or just about anywhere in South America and you'll see more trucks than cars at plenty of intersections. They've got more offerings from the brands we have stateside, plus a huge smattering of pickups most Americans have never heard of like SsangYong, Tata, Foton, Mitsubishi and other names you may or may not know. In order to sell their truck here, Mercedes would have to build it here. And their US production facilities are already sprinting to stamp out the plenty-profitable SUV formerly known as M-Class. Not to mention they'd have to tackle the brand image pollution discussed above. The Mercedes van lineup is already impressive and I think the company will be able to put together a damn fine pickup truck, which makes it an even bigger shame that we won't have the option of buying them stateside. Of course, even if we had the option of buying it here, there are no guarantees that it'd sell to the pickup buying public.